SKY tweeted about the reason for their decision on Friday. The controversy was over Sky News Australia replaying footage from the infamous video streamed by the murderer during the rampage. Nevertheless, News Corp’s Sky News Australia continued showing the footage, which prompted the pulling of the plug. 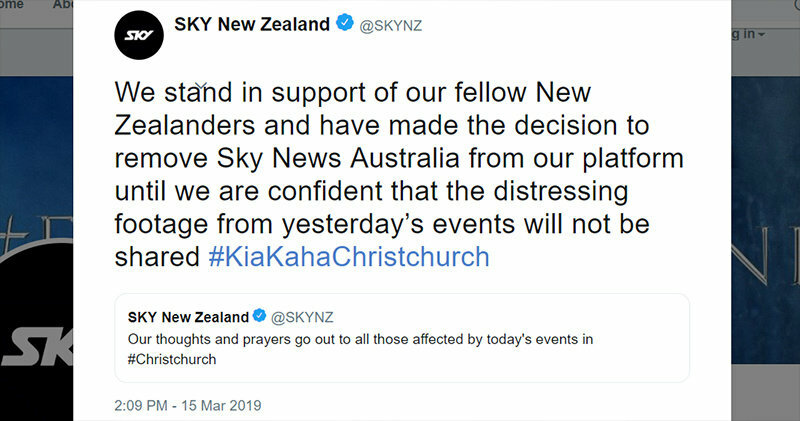 The above tweet from SKY New Zealand was deleted on Saturday and replaced with a more specific explanation. A spokesperson for SKY told the New Zealand Herald that the decision was made on behalf of their viewers and the people of New Zealand. Later, more emphasis was place on the integrity of the investigation, and credited Sky News Australia for prompt cooperation, in a statement to Buzzfeed. A bit of a story shift over the course of a day or so, in that they removed and replaced their tweet, and their spokespeople offered two different explanations for the basis of the decision, as well as who actually made the decision.